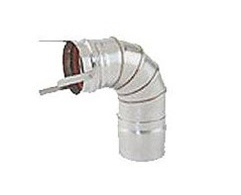 An adjustable 90 degree elbow like this can be a quick and hassle-free way to successfully make those bends with your chimney liner pipe. Designed specifically for use with Selkirk's Heat-Fad Saf-T setup it can adjust anywhere from 0 to 90 degrees and will fit pipes measuring 7 inches in diameter. It has been constructed out of a 304-alloy stainless steel to ensure product performance and is one of those pieces that can make an installation job that much easier.